The Better Business Bureau (BBB) gave Sixt Car Rental USA in Fort Lauderdale a C Minus as a rating. This is not good. Too many unresolved complaints show a pattern of unresolved issues resulting in complaints by U.S. customers. Is this rating justified? Sixt is a different car rental company in America – an American car rental company based in Florida with a stubborn German attitude from Bavaria. Sixt car rental USA in Fort Lauderdale, Florida, with 53 U.S. rental locations in Florida, Indiana, New Jersey, Minnesota, Pennsylvania, Nevada, Arizona, Massachusetts and coming soon to Hawaii, making it the number 4 car rental provider in the United States. This is according to Sixt Car Rental USA Managing Director Daniel Florence, who recently talked to eTN Publisher Juergen Steinmetz informing him of Sixt’s plan to get into the Hawaii car rental market, opening a location in Kahului, Maui, soon. Looking at Sixt’s North American locations, they are often gateways for European travelers. Steinmetz tried the VIP Greeting service when renting a Mercedes car from Sixt in Los Angeles recently and gone are lines and waiting for shuttle buses. A friendly agent will be waiting for you at the baggage claim and your Mercedes will be outside waiting for you. Travelers wanting to pay for the VIP treatment are able to get on the road in their car within minutes and in style. According to eTN research, the Sixt business model in Germany is one of offering corporate accounts the lowest rates for luxury cars but generating profit through insurance sales often accounted for by the corporate world different from travel expenses. In Germany, over-insurance and complete insurances are a way of life and corporate policies. This is very different in the United States, where the corporate focus when renting a car is not necessarily on insurance revenue and may have been a wake-up call for Sixt USA converting into the American mindset. Sixt offers luxury cars like Mercedes, but also Toyotas, Chevrolets and even a Kia within their U.S. rental portfolio. Sixt cars seem to have one mark in common. They all are brand new, look shiny without a scratch and the colors reflect a first class experience when entering the super clean parking facilities of Sixt USA. 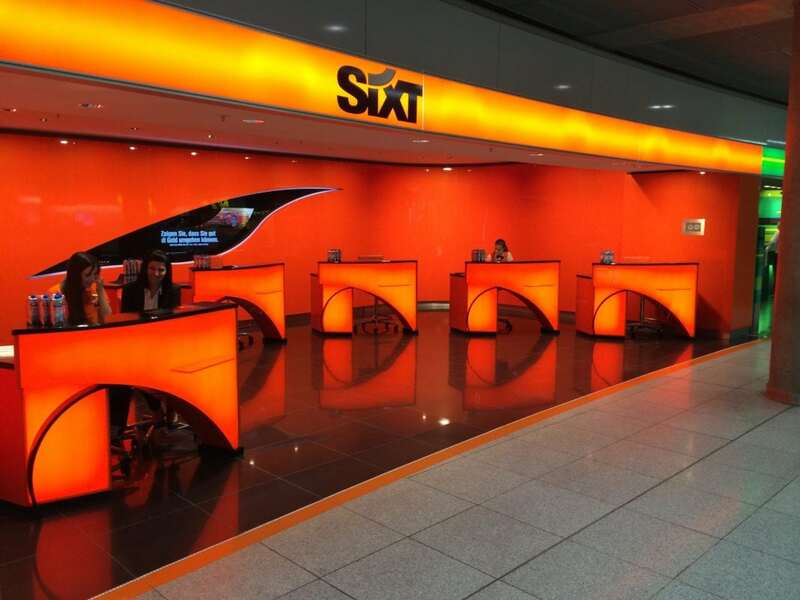 The almost blinding orange color theme when entering any rental counter or Sixt facility is uninformed throughout the rental process at all Sixt locations worldwide – and an important part of Sixt branding. Sixt is concentrating on its online business, therefore, the experience with the U.S. or German call center can be a frustrating one. Calling Sixt can mean long waits, endless options routing a customer to a dead end and low decision making power by an agent. It may explain low ratings for an excellent and established company on BBB, or U.S. online travel forums. Mr. Florence was aware of shortcomings in handling customer calls in the U.S. call center. He was aware of long waits, confusing options to route calls often into dead ends, and he was aware of a situation where customer service agents were not empowered or unwilling to make changes to resolve situations. Surprisingly at the same time, email responses are prompt, sincere and personal, and with a clear mandate to resolve any issues. This is refreshing compared to other large travel service businesses. According to Mr. Florence, Sixt will be rolling out a new state-of-the-art customer service call center approach. Globally, the company’s headquarters are located in Pullach near Munich, Germany, and it has more than 2,000 locations in over 100 countries. It is known for affordable luxury—offering premium vehicles, world-class service, and competitive pricing. Premium vehicles include Mercedes and BMW cars and super-clean facilities. Everything at Sixt appears different in a good way. Looking at the facility at LAX Airport in Los Angeles, it’s super clean, well organized and full of shiny brand new luxury rental cars. Sixt was founded in 1912 and maintains alliances with brands in the hotel industry, well-known airlines, and numerous prominent service providers in the tourism sector. The Sixt Group generates revenues of EUR 2.6 billion. In 1912, Martin Sixt founded the company with a fleet of 3 cars, creating the first car rental company in Germany. During the First World War, the fleet was confiscated and used by the German Army. After the war, business resumed, but the fleet was once again seized by the German Army at the outbreak of World War II. When the war concluded, the company rebounded, establishing a taxi fleet for members of the United States Army stationed in Germany. It then opened a taxi business in Munich with the first radio taxis. In 1951, the car rental company Auto Sixt was founded. In the sixties and seventies, the company expanded by opening branches at all major airports in Germany. In 1982, Auto Sixt was renamed Sixt Autovermietung GmbH, with the name Sixt/Budget in the logo. The company was transformed again in 1986, this time becoming Sixt AG, a corporation traded on the German stock exchange. In 1988, the subsidiary Sixt Leasing GmbH was established, and in 1993, the operating business of the AG was handed over to another subsidiary, Sixt GmbH & Co Autovermietung KG. Sixt AG acted thereafter as a holding company of the Group. In the 1990s, Sixt became Germany’s largest car rental company. At the same time, the Group expanded its business abroad to countries including Switzerland, France, and Great Britain. Tunisia, Morocco, and New Zealand followed in 1998. In 2001, Sixt expanded to the Middle East as well as other countries in Africa. Sixt began operating in the United States in 2011. In 1993, Sixt bought the assets of its competitor, Autoverleih Buchbinder, operating the brand briefly before finally discontinuing it. Sixt had failed to secure the naming rights and subsequently, Buchbinder was re-established and continued operating in the market. In 1999, the Bundesgerichtshof Federal Court (BGH) issue a landmark judgment against Sixt for illegal price fixing, requiring it to pay damages to its franchisees. Sixt had controlled de facto the pricing for the independent franchisees’ prices, as they were part of the Germany-wide reservation system. In the event of pricing discrepancies, the rental agreements were returned to Germany. This was deemed inadmissible under German antitrust law (price fixing of the second hand) and forbidden by the BGH. In 2003, the corporation was forced to defend itself against Hedge Fund Manager Florian Homm, who had speculated on declining stock prices. Homm was ultimately fined for price manipulation. In 2006, Sixt made a bid to take over its competitor, Europcar, when owner Volkswagen offered it for sale. In addition to antitrust concerns (Sixt at that time had an approximately 23% market share, while Europcar had 22%), there was also resistance on the part of the Europcar works council, which feared job cuts after the merger. Volkswagen finally accepted an offer from the French investment company Eurazeo. Since 2007 and via subsidiary companies, Sixt has operated the online brokerage of motor vehicles with the websites Autocommunity Carmondo, Mystocks, RadAlert, Winebase, and autohaus24. In 2010, former employees claimed that Sixt was opposed to setting up a works council. The company’s management denied the allegation. In 2013, Sixt AG was converted to the legal form of a European Company (Societas Europaea) and since then has been called Sixt SE. As part of the transition, a European Works Council (“Sixt Europe Leaders Forum”) was founded in 2013. In May 2015, the Sixt brought its subsidiary Sixt Leasing AG to the Frankfurt Stock Exchange. Regardless of their size and legal forms as partly exchange-traded corporations, all Sixt companies are economically controlled by the Sixt family. The first Auto Sixt company was founded in 1912 by Martin Sixt. In 1927, he handed over the management to his nephew, Hans Sixt. In 1969, the third generation entered the company with Hans’ son, Erich Sixt. Erich Sixt has headed the group for several decades, both as CEO of Sixt AG and Sixt SE. In 2005, the Management Board Compensation Disclosure Act (VorstOG) entered into force. Sixt AG became the first company in Germany to exercise the right not to disclose Directors’ salaries without a shareholder vote of at least a 75% majority. CEO Erich Sixt held at this time 56.8% of Sixt’s ordinary shares, corresponding to 89% of votes at the general meeting, meaning he was essentially able to determine the outcome. Overall, 98% of the voters approved the non-disclosure of executive pay. In 2015, the Supervisory Board extended the Executive Board contract of Erich Sixt until 2020. At the same time, Erich and Regine Sixt’s two sons, Alexander Sixt and Konstantin Sixt, were appointed as additional Directors of Sixt. The Supervisory Board expanded the Board from 3 to 5 members due to the strong growth of Sixt in recent years. Anyone in North America wanting to get a taste of German “Fahrvergnuegen,” should give Sixt Car rental a try. German luxury cars are expensive, so our advice is not to rely on your credit card insurance alone as that would hardly ever be able to replace a vehicle if necessary. Car rental companies in Germany including Sixt are known to look for that little scratch to repair when a car is returned. This strict policy may translate into something less known to customers in North America. It’s always important for anyone renting a car from any company to take photos of scratches or dents before driving a rental vehicle from the parking lot. This is regardless of an agent telling you not to worry. “I am renting cars constantly, but the Sixt rental experience was special. A rental experience that started out with challenges reaching out to the call center during the reservation process, but after all converted me into a happy customer”, said Juergen Steinmetz, publisher of eTurboNews. ” I was impressed how my comments were taken seriously by top management. I am convinced Sixt listened to my feedback. In communicating both with Sixt USA and Sixt Germany, I understand the challenges Sixt has. These difficulties are most likely due to a cultural translation of policies and an approach foreign to Americans on how to handle customers.